The Guide is replete with contacts, rumours and clues which will guide you on your quest for forbidden knowledge. Written as the companion volume to Bookhounds of London for Trail of Cthulhu, it can be used as a Keeper's resource as well as an in-game aretfact for players in any Mythos game. 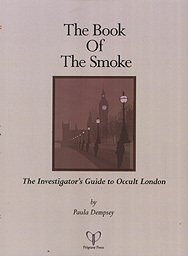 In 1933 a mysterious secret society commissioned Augustus Darcy to compile a guide to occult London. By the end of that year, Darcy was dead. Within these tales of The Smoke's legendary past are scattered clues to its future. Was a magical war brewing? Were forces from other dimensions breaking through into our own? Who were the mysterious Brotherhood? Who killed Augustus Darcy and why? After eighty years Darcy's book is here for you to make up you own mind. Use it as a guide as you venture into Darcy's world and may your gods be with you in the days ahead.